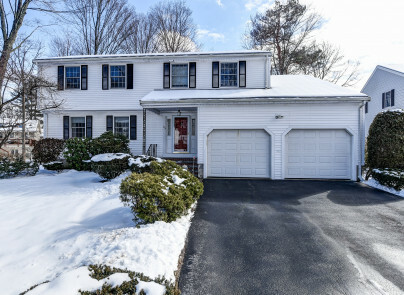 Located in a wonderful Needham neighborhood, this 4 bedroom/2.5 bath colonial has everything you are looking for. 1 mile town/train. Two car garage, nice yard, beautifully updated kitchen and baths, master bath, updated heat and AC, and newer roof. This home has been lovingly cared for. Kids in this neighborhood will attend the brand new Sunita Williams School when it opens in the fall. The living room and family room offer excellent spaces for entertaining. The beautiful eat-in kitchen has plenty of space to work, excellent pantry cabinets, and also a large kitchen table area. The back deck faces southeast and is a wonderful place to relax looking out on the yard.